this little munchkin is about the cutest thing i've seen - i loved the looks he'd give me! Awwwwww...he is growing up for sure and cuter than ever, love those BIG blue eyes and the way they contrast with the green chair!!!! Ryder is adorable!! Thank you so much! I would love to have you take more pictures for me! How Cute!!! His eyes are amazing. Is that Princess P's chair? I hope Cora's pictures turned out that cute. At first I thought this was a very strange picture of "W" because of the chair. Isn't that funny that a piece of furniture can be so recognizable. He is an adorable little boy! 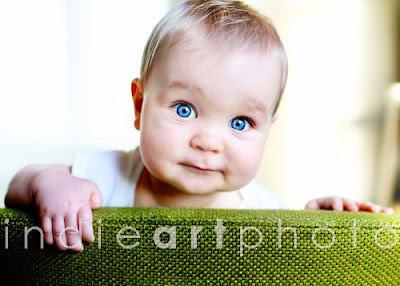 Love love love the blue eyes with the bright green chair/sofa/whatever. You do color like no other, my friend!